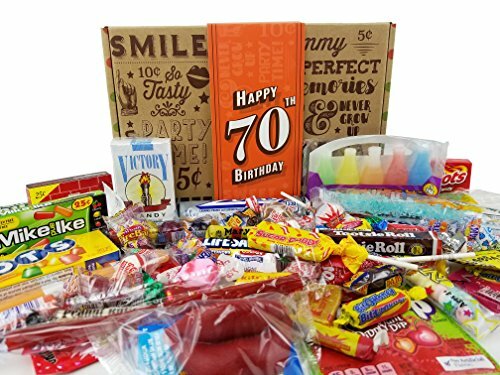 Introducing Vintage Candy Co.'s 70th Birthday Candy Gift Box - A Perfect Gift For That Special Someone Turning 70 Years Old! A Delightful Keepsake Box of Childhood Memories That Existed Cir. 1948. This IS THE PERFECT Milestone Birthday for someone Seventy. Its Also A Great Gift, If You're Looking For Something Fun AND Creative. It's Sure To Get Happy Chuckles, Belly Laughs, And Yes, Even Extreme "Girly Giggles" (We won't tell!). Order Now To Give A Great Gift That Will Be Remembered With A Smile! INCLUDES OVER 58 PIECES OF CANDY SOLD IN THE TIME PERIOD AROUND 1948. INCLUDES SPECIAL 1948 NEWSPAPER STYLE INSERT!